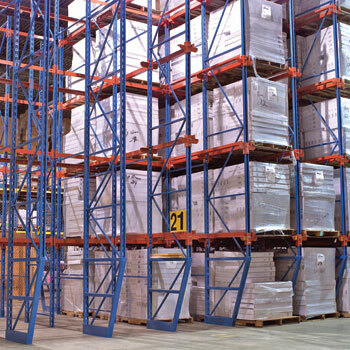 Mustang Material Handling is capable of handling your most demanding needs for pallet racking. We are able to provide any setup that you may need for your warehouse, factory, retail, or any facility. We also have a huge selection of affordable used racks available for immediate delivery & installation from our warehouse in Akron, Ohio. If you have a need for a special storage rack type that you don’t see here, please call us at + (330) 753-7225. Mustang Material Handling has a qualified team of skilled rack installers that are available to assemble pallet racking solutions for your facility. Mustang MH sells, services and installs pallet racking and warehouse equipment for customers in the Akron, Canton, Toledo, Cleveland, Youngstown, Columbus & Dayton Ohio areas. 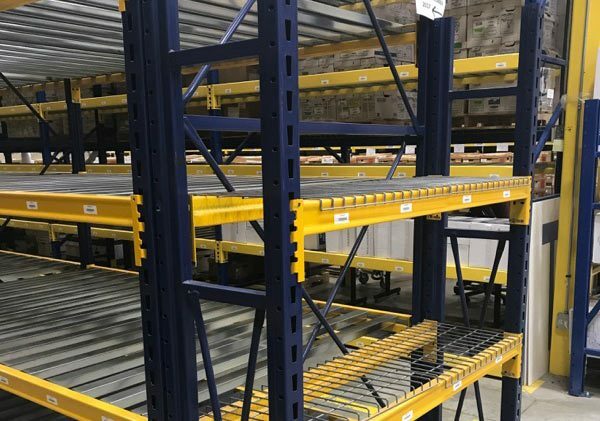 Selective pallet racking provides easy accessibility to all products at all times, which is important when the inventory is rapidly depleted and restocked. Selective rack is the most commonly used pallet rack system due to it’s high weight capacity and comparatively low cost. 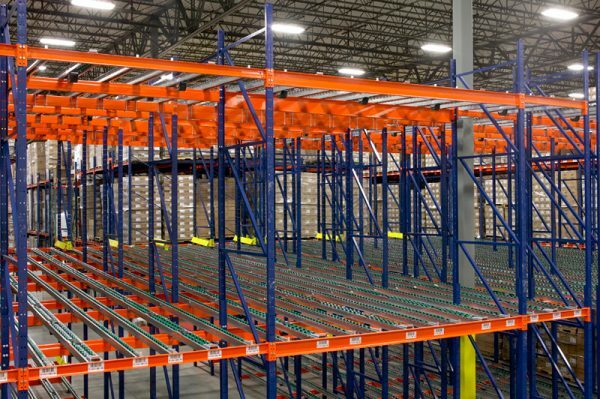 Mustang MH helps lower the cost even further by offering high quality used racking, in addition to a huge variety of new products. 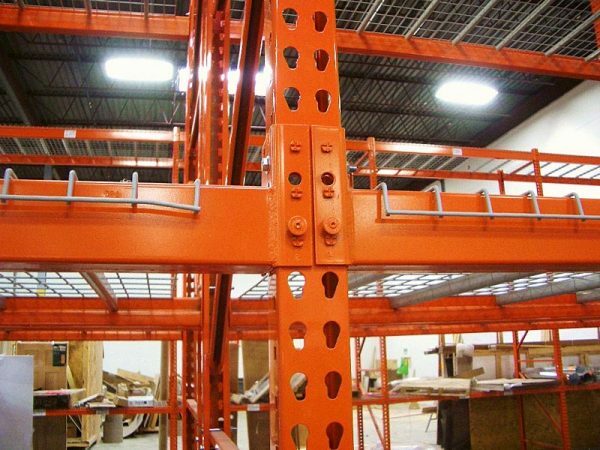 Keystone style pallet racking features upright frames engineered to promote the structural integrity of the rack system, columns with solid corners, and keystone slots punched in the area of least stress for maximum load capacity. Holes are punched on both sides and offset from the keystone connectors on the beams to prevent accidental dislodgement. Keystone slots and holes are punched in a single row on 3″ centers, allowing the beams to adjust in 3″ increments. 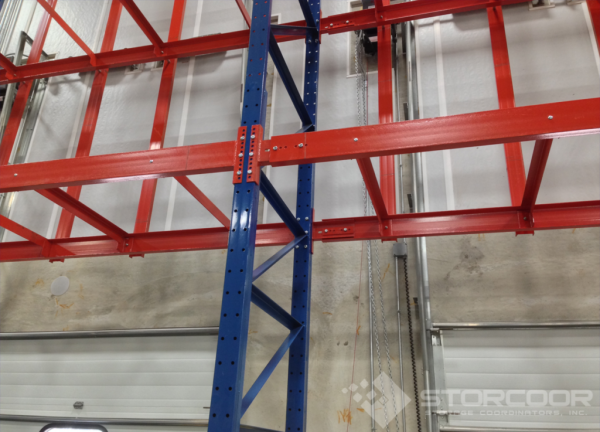 Structural pallet racks can be designed into the structure of the building itself, so that the upright columns are simultaneously used to support the roof of the storage facility, in which case the structural pallet rack uprights replace the storage building’s vertical support I-beams. This system is a rack supported building. Drive-in / drive-through (drive-thru) pallet racking are storage racking configurations that allow the forklift to drive directly into the lane of stacked rows (called a bay). The difference between a drive-in and a drive-through pallet rack system is simply whether the bays have an entry at only one end, or at both ends. Pallet flow systems are high density pallet storage systems that utilize depth to increase capacity. This system uses a slightly inclined rail with rollers that allow pallets to move easily along the sloped plane. These systems are also called gravity flow or dynamic flow systems. The pallet flow system often has complex motion and braking systems to control the speed of the moving pallet. 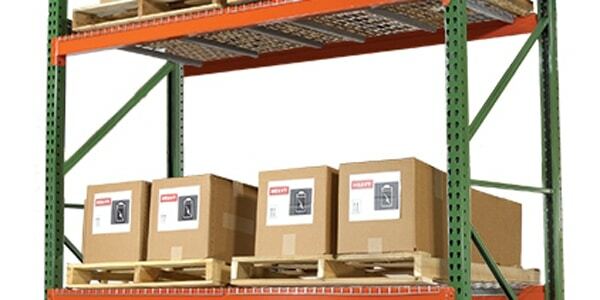 Push-back pallet racking systems are designed around the principle of organizing space by depth rather than width. This depth arrangement greatly reduces aisle space and increases storage density. In this configuration, each pallet is stored on wheeled carts that ride on rails. The rails are slightly angled toward the load/unload side of the rack and use gravity to move the pallet. When a forklift sets the pallet onto the cart, it drives forward and causes the pallet to bump the next pallet, causing the entire row of pallets to roll backwards. When removing a pallet from the front position the remaining pallets immediately stage themselves forward so that the next available pallet can be accessed. 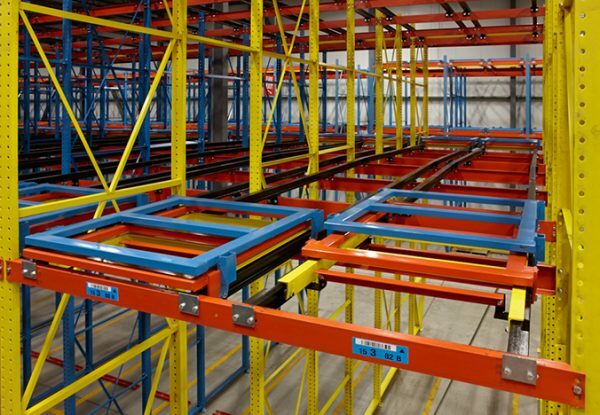 Teardrop style pallet racking, also known as “roll formed” selective rack, allows pallets to rest on the horizontal load beams that are held in place by mounting clips. Because the clips on teardrop configurations can be quickly moved, the shelves can be easily adjusted to different heights to accommodate various load sizes. This is convenient for a warehouse with changing needs. Cantilever is best utilized for the storage of long, awkward items like lumber, plywood, steel bars, tubes, rolls, furniture, and sheets. 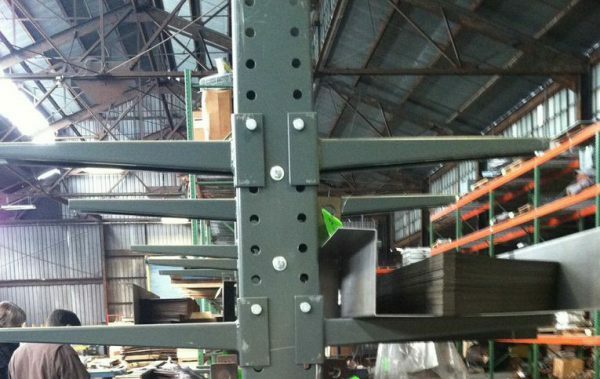 Since there’s no support beams in the front, the cantilever pallet rack allows easy loading and unloading. Used Pallet Racks can be great way of improving your warehouse as well saving money for additional projects. At Mustang Material Handling we hand select only the best used racks on the market. 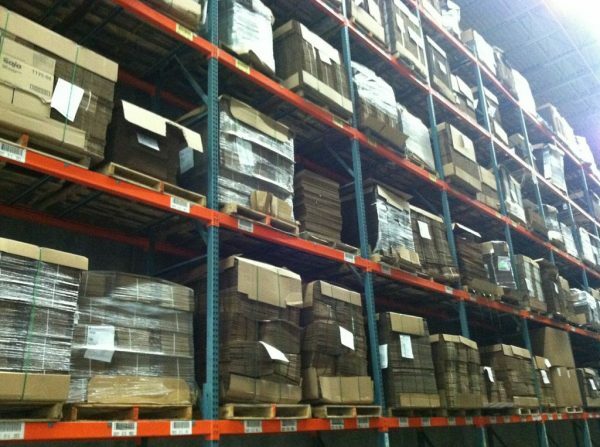 Aside from the cost savings, a key advantage of a used pallet rack is the immediate availability directly from the Mustang MH warehouse. When you buy pre-owned rack from Mustang MH, you also save money on freight, since you don’t have to have it shipped from the factory. 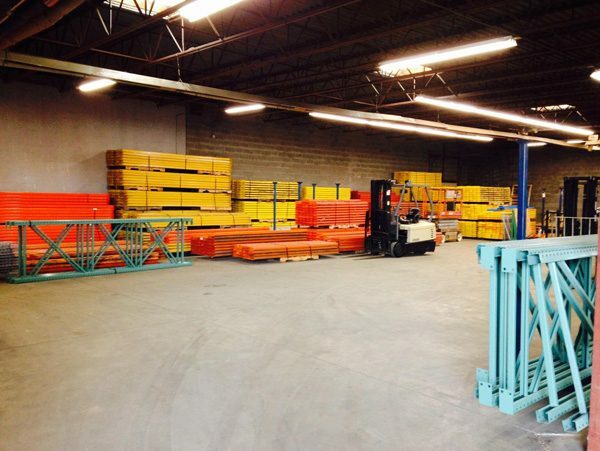 Check out our used pallet racks and other used equipment.